The great advantage of online payments is that parents can enter their preferred payment method, enable auto-pay, and let our system collect their payments on each invoice due date. Worry no more about tracking errant parents down, sending invoice reminders, or charging late payment fees. 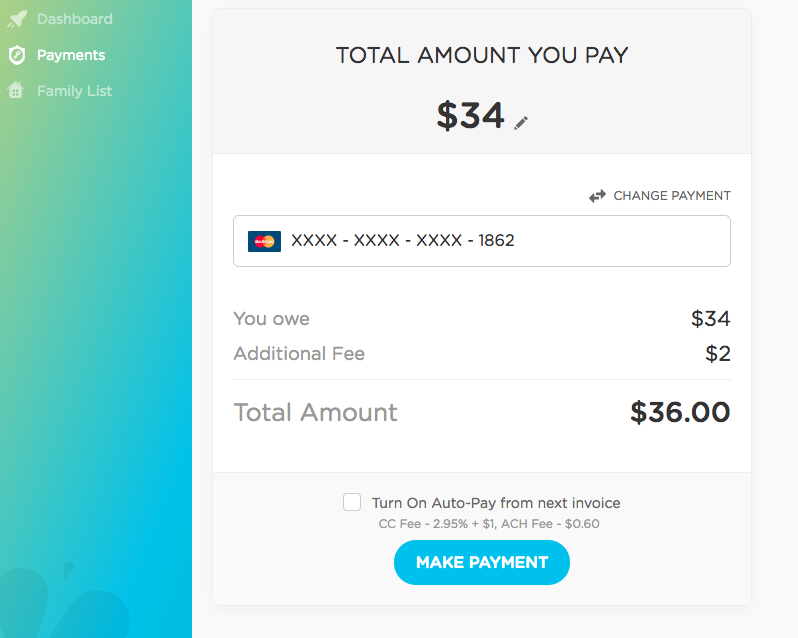 Parents can opt to set their card on "auto pay" which means when an invoice is sent, the payment is automatically deducted from their account on the due date. Parents can leave "auto pay" turned off and manually initiate payment when they receive the invoice. Once a payment method is on file, the school has the option to manually pull the owed funds from parent payment accounts (even if they have "auto pay" turned off). *Note: there is a $5,000 limit per transaction.